Sharing a room in a rehabilitation facility can bring with it many questions and concerns, especially for those who are not used to semi-private rooms and are unsure of what to expect. There are a few things to know about semi-private rooms and some tips that you should follow if you want to get the most out of your experience with this kind of living situation. 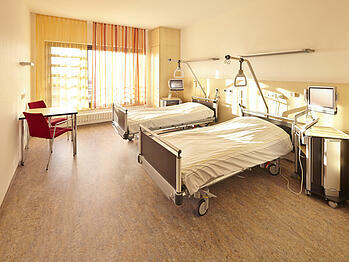 Every rehabilitation center has different rules and regulations when it comes to how rooms are assigned. In most cases, the facilities will try to match you up with other people who are dealing with the same kind of rehabilitation situation that you are facing, but this is not always the case. Administrators at the facility will help you understand how the process works and what to expect. If you are the first person to move into a semi-private room, it is important that you make sure to prepare for eventually living with someone else. Even though you may have the entire room to yourself for now, try to keep your things in your designated area of the room, which will make the transition much smoother for your future roommate. For those that are moving into semi-private rooms where there is already one or more person living in the room, it is important to be respectful of your roommate yet still get everything you personally require to have a positive experience. With some communication, this task is much less difficult than you might think: many people going through rehabilitation therapy are very happy to have someone to share their experiences and living space with. Rehabilitation can be a difficult process that takes an extreme mental and emotional toll on patients. To help you cope with this stressful situation, things like pictures, plants, letters from friends and family, or other unique items can all be put up in your room. Remember, however, that you should be conscious of your roommate as well: keep your personal items to your space, unless you come to an agreement that allows both of you to do otherwise. Even if you are used to the privacy of your own room, sharing a room with another person in a rehabilitation facility does not have to be difficult. With the right attitude and a sufficient understanding of how the move-in process works, you can enjoy all of the benefits of sharing a room and a strong bond with someone you live with.